Fairytale It was fabulous! Fearlessly, you found the 3 fetishes in the Finnish fjord. With light-footed and foxy feints you ferry the fetishes to prince Fieso in France to free the fascinating faerie Fabula. But Fieso is not fond of foreigners, what a fiasco! 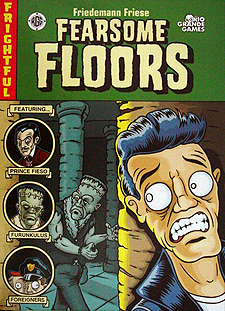 You land freezing and foolishly find yourself trapped in a frightful fortress with fearsome floors. Now you must flee Fiesos trap. Furunkulus, the monster, is a frightening freak, especially fond of foolish foreigners. He will feed on you if he is able. So you want to fool Funrunkulus and flee to freedom. Fearsome floors is a racing game with a twist. Not only must you be fast to the goal, but you must also avoid the monster Furunkulus along the way. Through clever moves, the players try to move the monster so it goes after other players. In the basic game, players can hide behind stones and slide through pools. Experienced players can add transparent crystals, turning stones, and teleporters. Plan carefully, move quickly to the goal, and avoid the monster to win this game!